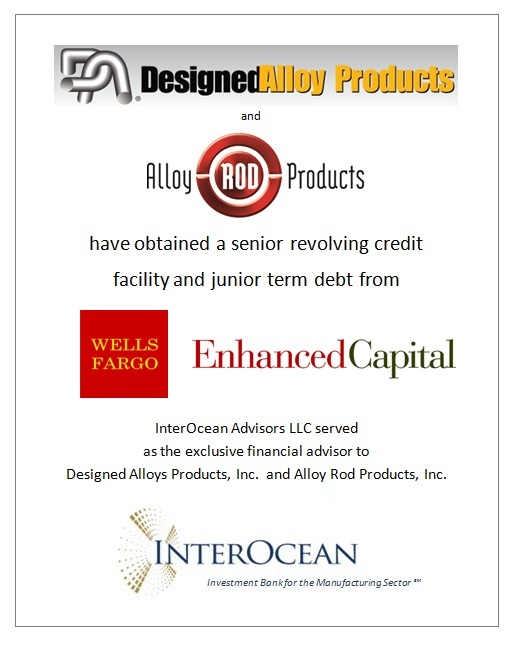 InterOcean Advisors LLC (“InterOcean”) announced today that Designed Alloy Products, Inc. and Alloy Rod Products, Inc. (collectively “DAPI”), which manufacture certified ingot and alloy rod products and process scrap metal, have successfully refinanced their senior debt capital. DAPI, headquartered in Aurora, Illinois, obtained a senior revolving credit facility from Wells Fargo Bank and a junior term debt loan from Enhanced Capital. InterOcean served as the exclusive financial advisor to DAPI. DAPI supplies its products to mills and foundries in the United States and to distributors serving foreign markets. End markets for its alloys also include dental labs, jewelry producers, and agricultural and industrial equipment and component manufacturers. DAPI has manufacturing operations in Illinois, Oklahoma, Pennsylvania and Tennessee. The transaction provides an opportunity for DAPI to accelerate its growth and expand its distribution network. DAPI produces and distributes cobalt and nickel alloys, stainless steel, brass/bronze alloys and tool and alloy steels in certified ingot, certified bar, scrap and base raw material form. These products are used by foundries and stainless steel mills. The company also supplies dental alloys, jewelry alloys, hard-facing/wear resistant alloys and agricultural hard-facing products to dental labs, jewelry producers, and agricultural and industrial equipment and component manufacturers. Wells Fargo & Company is a nationwide, diversified, community-based financial services company with $1.5 trillion in assets. Wells Fargo provides banking, insurance, investments, mortgage, and consumer and commercial finance through more than 9,000 locations in 36 countries. Wells Fargo serves one in three households in the United States and ranks No. 25 on Fortune’s 2013 rankings of America’s largest corporations. Wells Fargo ranked fourth in assets and first in the market value of its common stock among all U.S. banks at December 31, 2013. Headquartered in New York City, Enhanced Capital is a diversified, national asset management firm providing investment capital to small businesses that are underserved by traditional sources of financing. Enhanced Capital seeks to create innovative structures that fit the needs of small businesses, helping them to grow and create value for constituents. Enhanced Capital has regional offices in New Orleans, Austin, Birmingham, Denver, Jackson Hole, Nashville, Stamford, Tampa and Washington, D.C.